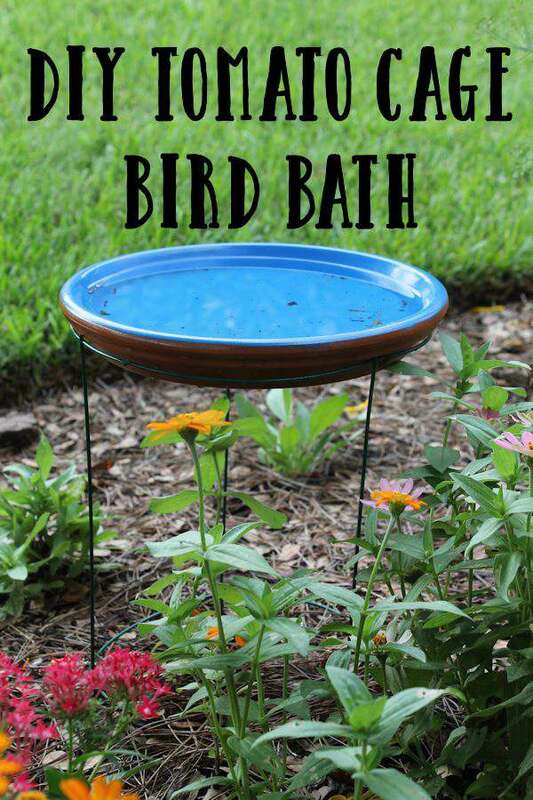 Looking for a very easy way to make a bird bath? 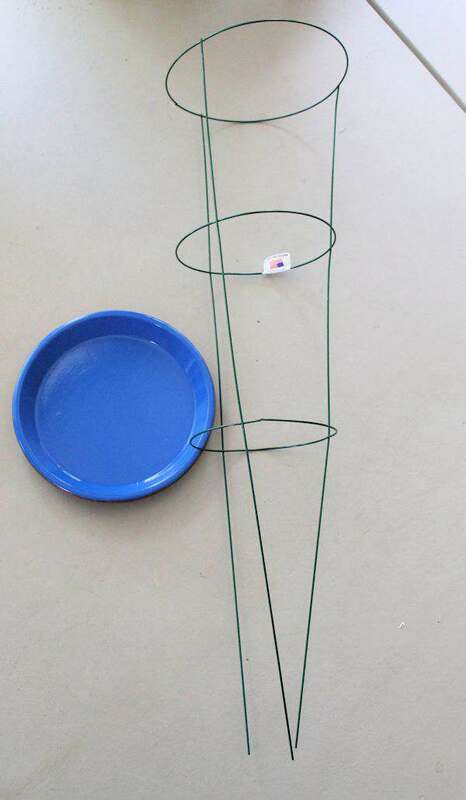 All you need is a few garden items and this DIY project done in minutes with a tomato cage. Oh, how the garden is producing right now. Zucchini and squash are being picked almost every day. I’m so glad I used the hybrid seeds this year in the garden because it has been a total success compared to last year when my squash turned to mush. It could be that I am using raised gardens with really good soil or hybrid seeds or a combination of both. I am going with the seeds as a major component. Especially for my area. There is nothing like fresh green beans and I think I will have one more picking and they will be done. I will try them one more time in the fall and if they don’t produce any better, I won’t plant them anymore. You have to plant many plants to get a lot of green beans. Its one of those things that its easier to buy them in the can or fresh from the marketplace. I’ve already had to spray my tomatoes with organic garden spray for worms and I’ve only had to deal with a couple of snails. One way I have learned to keep snails from getting to my plants is to keep the squash leaves up off the ground to keep the snails from traveling on them. Get rid of any “bridges” for them to climb on from the ground and I also use a bit of snail bait to keep them off my peppers. Seems that’s the only thing they want to eat in my garden. Now let’s make a bird bath. One area of my gardens I haven’t spoken about is my Butterfly Garden. A very small area by my lanai with only butterfly, bird, and bee-friendly plants. Since this is a small area, I needed a small bird bath that would withstand the Florida sun and heat. Not easy to find. So, what a gardener to do? Make one! I choose a green tomato cage so it would be hidden in the garden but there are so many fun colors out there today to choose from. Next, I also took my terracotta pot bottom and painted it with a coat of primer, then a couple coats of outdoor blue paint I had in the garage and also spray sealed it. The color of the blue gave it a swimming pool effect. 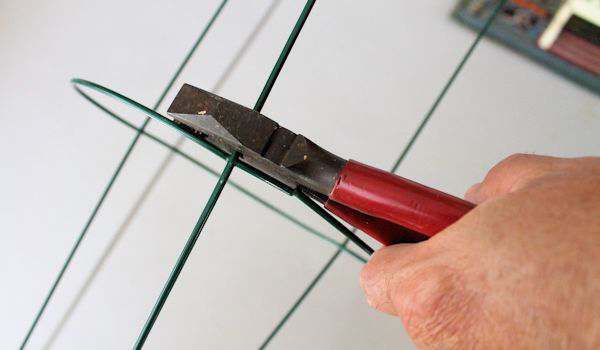 Mr. G then cut the wire off right above the bottom ring of the tomato cage so it wouldn’t be so high in the garden. You wouldn’t have to do this if you have a larger garden. Insert the tomato cage in the garden and just lay the pot bottom on top and fill with water. What I also love about the bird bath is it’s so easy to clean. Just take off the top, wash off and refill with water. The paint has held up nicely with no chipping. So be sure to seal it before using it with a good polyurethane clear spray. I have a pair of doves who like to hang around my garden and they love sitting up in the birdbath in the morning to enjoy a drink. 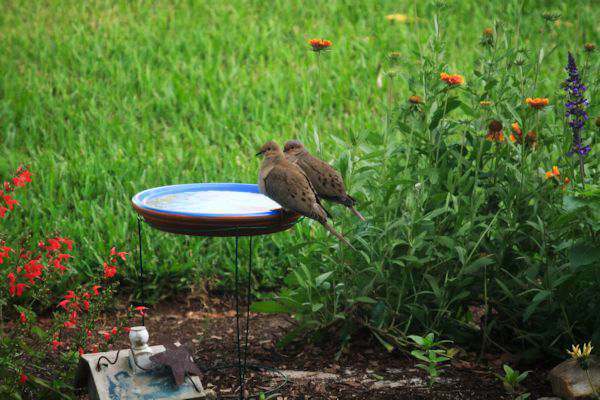 BIRD TRIVIA: Did you know that doves are the only birds who drink with their heads down? All other birds will take a sip and then hold their head up so the water will roll down their throats. Thank you Cindy. I plant flowers most of the summer here in Florida because their growing season isn’t as long as the warmth is. I like flowers 365 here. Thanks for stopping by. Oh you can grow all kinds of veggies in containers on an apartment porch area. I grow tomatoes, herbs and other items in pots. Containers might work for you. A 2 gallon pot can get you some lovely tomatoes or peppers. Herbs, or even strawberries can be grown! I use my deck as the bulk of my garden because we have so much shade where I live. And if I travel, I put the pots in the bathtub with water in it so that they won’t dry up while I’m gone. I do use containers to grow certain things and at different times of the year. Love this birdbath! Very smart idea! Your garden is beautiful! You must have read my mind, because I have been trying to figure out how to make a bird bath, and I have like 6 tomato cages the previous renter left behind. This is absolutely perfect. I hope this idea works for your garden too. Stephanie and thanks for stopping by. What a good idea! I love watching the birds drink and splash in the water! Me too Wendy. I had those items and extra spray paint, so basically that project didn’t cost me anything except my time. Thanks for stopping by. Great idea! 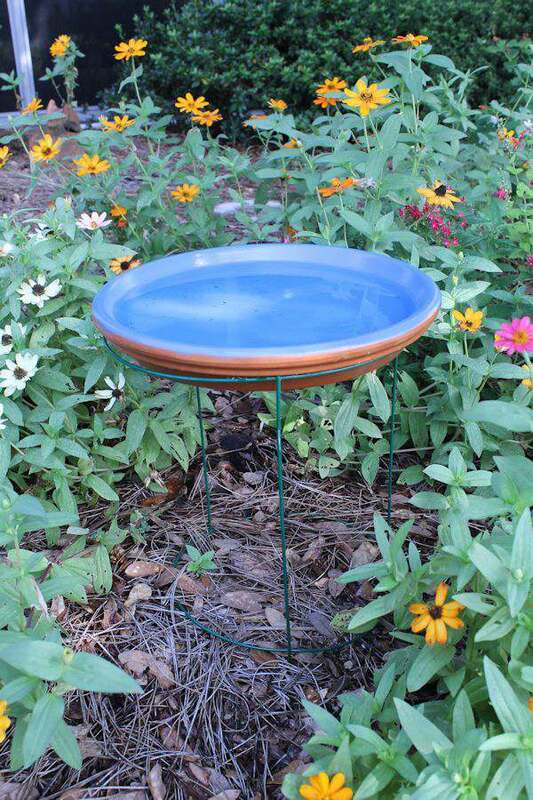 Looks like the tomato cage works great for a birdbath, and simple to make. I pour beer in a disposable container to help with my snail problem. They climb it in and die. HI Linda and thanks for stopping by. I have heard that beer works very well with that. Another idea for me to try. Yes I was amazing how well, but you have to empty containers regularly or they get smelly. Yes, you do have to keep the bad water out of them. I clean mine out at least once a week. The birds appreciate it for sure. Tammy, this is such a clever idea! I love that the “legs” are easy to hide in the foliage. You might be seeing one in my garden, too! What a lovely garden and such a creative bird bath. Thanks for linking up to the Bloggers Brags Pinterest Party. I have pinned to the Bloggers Brags Broad. The birdbath idea is genius! I love fresh green beans and hate canned green beans. I usually plant some, but I have been too busy with trying to move! What a great idea for a project. I love it. It’s simple and it came out great. 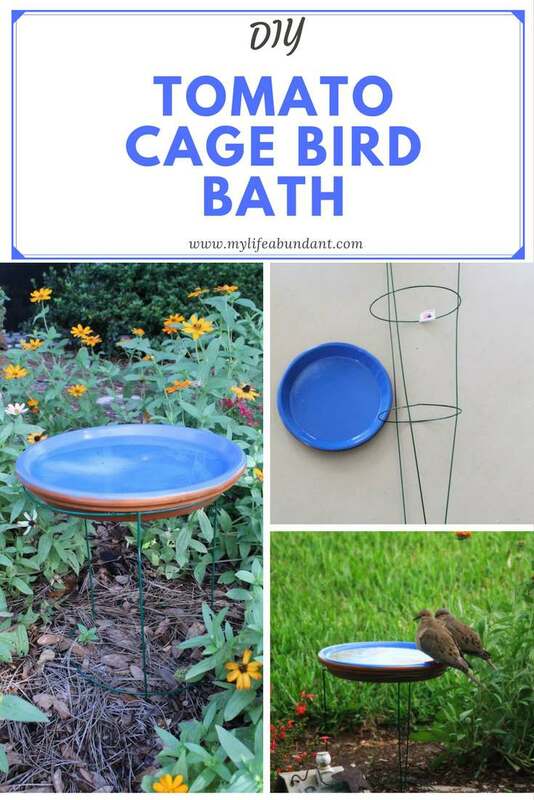 The tomato cage birdbath is a super cute idea. I think I have all those things to actually makeone today! Down to the spray paint! guess I know what I”ll be doing this afternoon! Cool idea! Nice and easy DIY idea.. i am sure my kids would like to do this in our gardens..
Great project for kids. They could paint all kinds of things on the terra cotta bottom and then after sealing it, it will last for a long time. You are creative I would not have think of such idea a bird bath. Love the image made your garden project look simple elegant. This is awesome! I love how you created something so simple yet beautiful. I love gardening! Thank you Michelle. I love using what I have first, if possible. I love this idea. It’s so wonderful to have so much nature and beauty in your own backyard! What a great idea for a bird bath. I didn’t know that about birds. I thought all of them will take a sip and put their heads up. This is so awesome. I think my daughter will have more fun with this than the birds. Lol… So trying it! I have not even thought of a bird bath since I was a kid. I think my kids would enjoy making this. That is just SO smart!!! I’m a little ticked that I actually bought one now. Next time I’m making one! That’s a lovely garden accent! omg what a cute and adorable bird bath!!! This would look super cute in my backyard! HI John. Since my garden is soooooooo small, I really had no choice to use the bush style beans. I knew from my mom and hubby that the bush beans don’t produce as much and pole beans do much better. I am wanting to try some kind of pole system to use in one of my square foot garden areas and see how that works. what a brilliant idea! I thought they’re not sturdy enough. I’ll try this out! 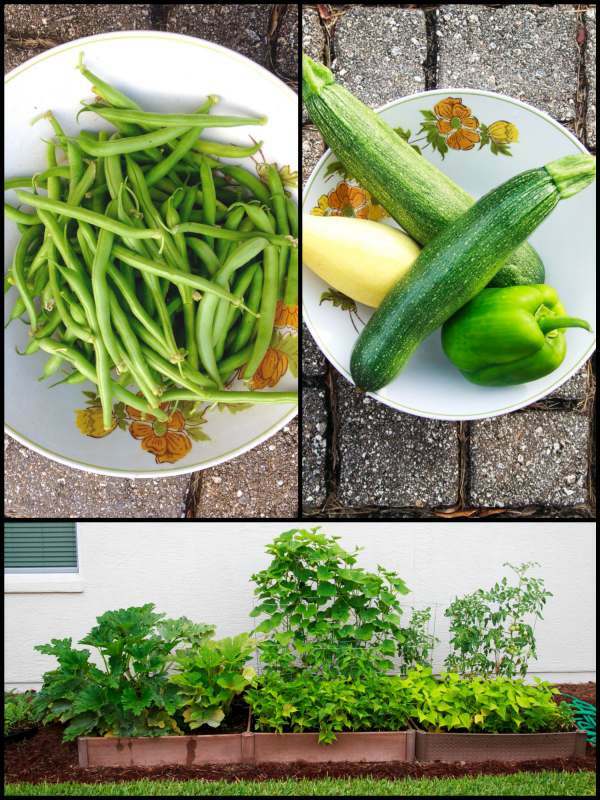 I use tomato cages to grow green pole beans….eight plants around the base works great. Sometimes I have too many beans! Did everyone know that green beans are great for dogs who are portly? Just cook them up and substitute them for half of the dry food you normally feed. No wasting the uglies either! Blessings! This is so clever. So many people have the stuff for this lying around. Thanks for posting. Hello from Wonderful Wednesday. This is a great idea! What type of paint did you use? I want to make sure that I don’t use anything toxic as I don’t want to harm my feathered friends. HI Michele. I just used Rustoleum outdoor paint for the color and then sealed it with poly. I actually don’t know any outdoor paint that wouldn’t have some kind of chemical in them. The birds don’t have any problems with it and have loved the bird bath for quite sometime now. The squirrels will even clean their food and drink out of it. I am so happy to find a blogger from Florida. I’ know, Tammy, that you understand the heat and humidity we live with. Thanks Cathy for stopping by. I hope you enjoy it. Tammy I found a large shallow beautiful blue ceramic glazed bowl at a thriftstore for $2, so I don’t even need to paint anything! Oh I bet thats beautiful. I would love to see that. Thanks for sharing.